Irreverent squirrel Surly (Will Arnett), a loner, is excommunicated by Raccoon (Liam Neeson) and the rest of the animals at the park for accidentally destroying the food they've stored for the winter while greedily hoarding some of his own. Plucky chipmunk Andie (Katherine Heigl) makes him her salvage project. 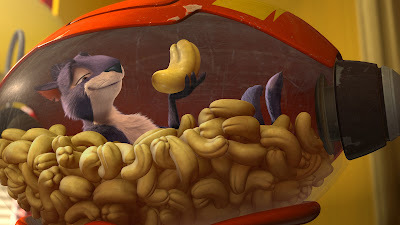 And Surly soon finds a way to get back in everyone's good graces when he ends up masterminding the "robbery" of a fully-stocked nut shop in the city. Meanwhile, a trio of human criminals are using the shop for their own nefarious purposes. And the Machiavellian Raccoon might not be the benevolent leader the other animals believe him to be. 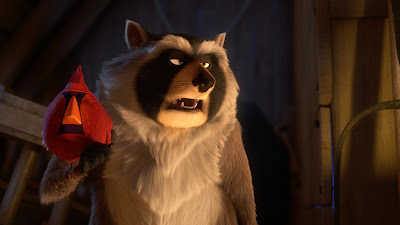 While I found it refreshing to see a kooky mash-up of actors like Arnett, Heigl, Neeson, and Maya Rudolph (as a pug belonging to the human crooks) in the voice cast, this contributes to The Nut Job's overall unevenness. Never has it been more apparent that animated movies primarily record their voice actors independent of each other. Arnett and Rudolph play at the right pitch. But Neeson is a touch to stentorian as the antagonist. Heigl's contralto voice is just all wrong for the female lead. The mid-20th Century setting of The Nut Job is surprising enough to have pushed the film to the plus column for me, particularly as it relates to another movie that may have had some influence on it. And while the movie gets draggy midway, there are sufficient laughs and slapstick gags that make it worthwhile enough to recommend as a family escape away from the cold. It many not always be on target, but The Nut Job is a serviceable kid movie that at times feels inspired. sounds good. i guess i need to add this to my list to watch. I've really enjoyed reading through your blog. Following you now.